We are a leading IT / Technology Services of Bonrix SMS Express, Bonrix SMS Manager, Bulk Sms, Bonrix Longcode AutoReply SMS Android App, Bonrix Smart SMS Android App and Bonrix Push SMS - Notification from Ahmedabad, India. 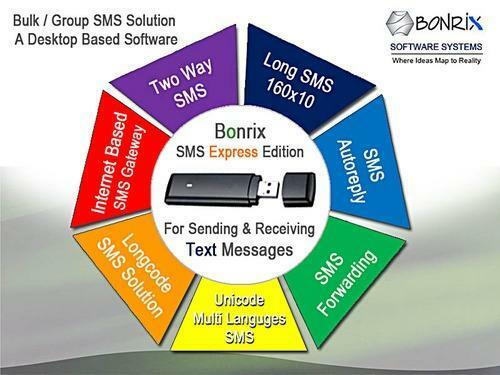 New Bonrix SMS Express Edition for sending bulk/group SMS via CDMA, 3G, GSM, GPRS, HSDPA Modem and Handset. Compatible with almost all Nokia and other modem which are supporting AT Commands. Two-Way SMS Supported. Bulk / Group SMS Via USB 3G Internet Data Card, Auto Reply SMS, SMS Forwarding, LongSMS, Longcode SMS Solution, Internet SMS Gateway Solution, Unicode - Multi language SMS, Two-way SMS and HTTP API SMS URL. New Advance Bonrix SMS Manager with Scheduling, Autoreply, Forwarding, Address book and Incoming & Outgoing SMS Reporting Features. Compatible with all kind of Bonrix SMS Server for sending bulk SMS. Bulk Messaging is the large numbers of SMS messages for delivery to mobile phone terminals. Bulk messaging is commonly used for alerts, reminders, marketing but also for information and communication between both staff and customers. Bulk messaging lets you deliver SMS messages to mobile handsets almost anywhere in the world. Packaging Details: New Bonrix SMS Express Edition for sending bulk/group SMS via CDMA, 3G, GSM, GPRS, HSDPA Modem and Handset. Compatible with almost all Nokia and other modem which are supporting AT Commands. Two-Way SMS Supported. Bulk / Group SMS Via USB 3G Internet Data Card, Auto Reply SMS, SMS Forwarding, Long SMS, Longcode SMS Solution, Internet SMS Gateway Solution, Unicode - Multi language SMS, Two-way SMS and HTTP API SMS URL. Two Way Messaging platform which allows you to receive SMS, besides sending SMS. This allows you complete flexibility in managing your incoming messages. You can forward or auto respond these received messages as per your need. This Android App "Bonrix SmartSMS" is designed for sending group sms /Bulk sms directly from Android handset using immediate contact saved in your phone book. * SMS termination service is avaiable only for INDIA. All GSM/CDMA/3G/4G Indian Telecom network are supported and sms will be delivered on immediate basis. Current SMS Package pricing are as bellow. 1. Single SMS Compose facility for Transactional and Promotional SMS both. 2. Group SMS from Phone Book group. 3. Multiple contact selection from phone book and send instant SMS. 4. Use Group created on web based platform for sending SMS. 5. Check SMS consumption. Track current SMS Balance. 6. SMS termination reporting. Track Delivery report of SMS. 7. Export your PhoneBook Contacts on Web Group. 7. Instant notification for App upgrade and new offer. Bonrix Push SMS & Notification Alerts Apps is based on Google Cloud Messaging platform for notifying user withcurrent alerts or message very instantly using data service (GPRS/3G/CDMA/WIFI) in place of traditional SMS / Text messaging service. Thus it provide cost effective solution for keep you client or subscriber being notified almost free of cost. please visit following website for sending free Push SMS. This Android App "Bonrix Smart SMS" is designed for sending group sms /Bulk sms directly from Android handset using immediate contact saved in your phone book. This App is associated with Web based BULK SMS platformfor sending all type group SMS either Transactional or Promotional SMS. SMS termination service is avaiable only for INDIA. All GSM/CDMA/3G/4G Indian Telecom network are supported and sms will be delivered on immediate basis. This tested against Indian SMS service provider. Transaction SMS package required special approval, which is available after submitting necessary authority letter. I Bonrix SoftWare user you Surely like this product. HighSpeed SMS helps mass delivery of short messages for various occasions e.g. public and business events, important information to targeted audience, business marketing and many others. The application is a product of MicroNet Infocom & Logistics Private Limited and distributed free for existing and to be Bonrix SoftWare customers. Existing customer of Bonrix SoftWare bulk sms service can use this application with their Bonrix Soft Ware username and password. - Single SMS Compose facility for Transactional and Promotional SMS both. - Group SMS from Phone Book group. - Multiple contact selection from phone book and send instant SMS. - Use Group created on web based platform for sending SMS. - Check SMS consumption. Track current SMS Balance. - SMS termination reporting. Track Delivery report of SMS. - Export your PhoneBook Contacts on Web Group. - Instant notification for App upgrade and new offer.